Buttermilk ranch dressing is what inspired me to adapt the original recipe found on another blog. I used a dry ranch dressing mix to add some ranch flavor into the buttermilk cheese sauce. And what would a buttermilk ranch dish be without bacon? With that said, crumbled bacon is stirred in with the pasta to add a bit of texture and flavor. 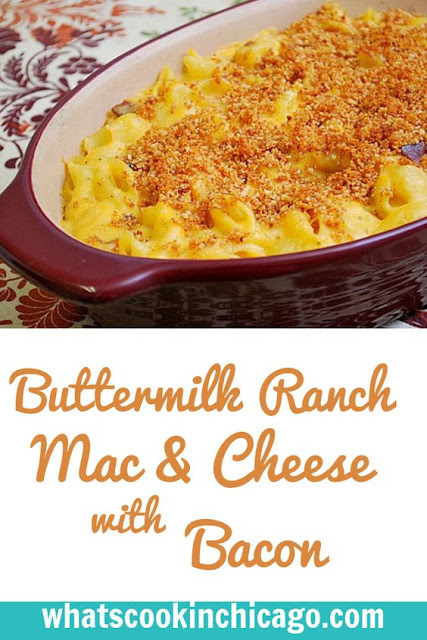 Overall, this was one of my favorite mac & cheese recipes... and who knew buttermilk would work just as well?! Preheat oven to 350°F. In a large pot, bring three quarts of water to a boil. Add salt to season. Cook macaroni until al dente. Remove from heat, drain, briefly rinse under cold water, and drain again. While the macaroni is cooking, heat the butter in a pan over medium heat. Once melted, whisk in the flour until well combined. Reduce heat and gently cook, whisking constantly, until the mixture just begins to darken. Mix in 6 oz. of the shredded cheese, the buttermilk, and the dry ranch dressing mix. Stir until the cheese is mostly melted and then turn off the heat. At this point the cheese should be completely melted and the ranch dressing should have flavored the sauce. Stir in the cooked pasta and crumbled bacon. Mix well to combine and season with salt and pepper to your tastes. 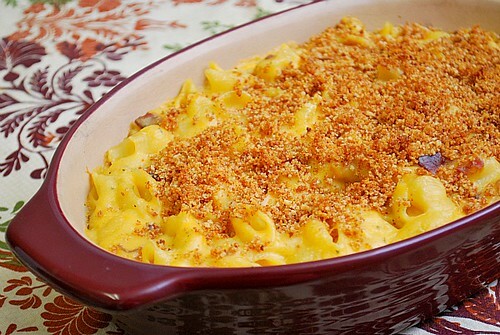 Pour into a large casserole dish and top with the remainder of the cheese and the breadcrumbs. Cover loosely with foil and bake for 20-30 minutes. Remove foil to brown the top. You may want to move the dish closer to your broiler if you want, but watch it closely as the breadcrumbs can very easily burn. Allow to cool for a few minutes before devouring. There is no doubt about that!I don't think I know anyone that doesn't love mac & cheese. I must say yours looks delicious. Whoa, this looks amazing! I have never thought about ranch flavor in mac n cheese, but it sounds like a perfect combo! This is one of the best things I've ever tasted. I could eat a whole dish.